Interesting to me was that in many ways the show is a descendant of the ‘classic’ Les Miserables – now in its dying days – in the enormity of the story it tells, and particularly in its design: a simple standing set seemingly of brick and wood, the space transformed by the simplest placement of props and furniture, movement enabled by big revolves. No projection. But everything in that space is controlled, enabled, shaped and supported by lighting. Show-lighting practitioners have long debated whether show lighting is an ‘art’ or a ‘craft’. The discussion often falls back on trying to define exactly what those terms mean: craft perhaps the work of making something well, honing it to serve a particular purpose, the master carpenter making a wonderful piece of furniture. Art, a freer thing, taking an abstract idea that existed only in the mind and conjuring it into reality. The conclusion usually reached, before the conversation moves back to the latest scurrilous gossip, is that lighting is both. You need the vision in your mind, the art, then you need to know how to implement that, the craft. Plus, unlike artists who create entirely self-contained work, lighting has to respond to, and so is shaped by, input from others: the physical design, the staging, the performances. It’s a collaboration, and on the best shows a multi-way collaboration where lighting is shaped by other elements, but in return it inspires and shapes them until everything becomes an inseparable, cohesive whole. Arguably, show lighting shouldn’t make much sense if performed without its show. Which is what makes Howell Binkley’s work on Hamilton so fascinating. The show is a whirlwind of carefully structured shapes and patterns on the floor, sometimes of raw light, often light broken up by gobo – steel or glass stencil – patterns. It is a descendant also of Tharon Musser’s design for the original A Chorus Line, which created a Mondrian of rectangular coloured blocks in which the dancers performed. 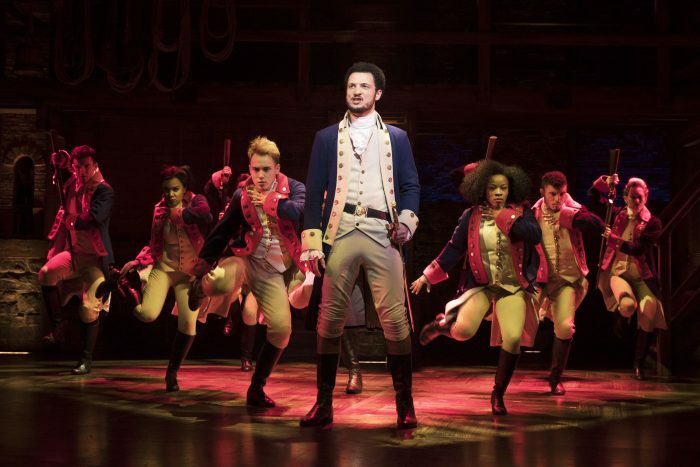 In Hamilton, today’s technology lets the designer take things a step further: there is beauty in each pattern in itself, but also joy in the way they shift and evolve from one to the next, rising in, opening up, swirling, morphing, dissolving. There is art here, a designer’s vision that brings another layer of life to a remarkable show, adding to it rather than distracting from it – but in a way that might almost work as an entertainment all on its own. There’s also a high level of craft, from the designer, their support team and the theatre team who maintain it: making this kind of thing work is hard work. Art and craft in perfect harmony. And in support of a great show. Really, the best of what show lighting should be.